Project obstacles and solutions: Keeping the delivery of building materials on schedule can make or break any construction project. One delay can have a ripple effect that elongates the building process. The new Subaru facility in Lebanon, Indiana required 14,000 tons of 53 stone for the foundation sub-base to be delivered, graded and compacted during a 3-1/2 day window. The IMI Stony Creek Stone Quarry in Noblesville, Indiana was selected as the source of the stone. Normally it would be a 28 mile trek between the quarry and the job site. However, the main highway between the two locations was shut down for repairs. This required drivers to add an additional 12 miles each way which would traverse through Indianapolis. IMI Aggregates personnel opened the Stony Creek location 1-1/2 hours early to ensure that the initial deliveries would be ahead of rush hour traffic. Loaders, scale house operators and sales reps were on the job early and in constant communications to make sure the deliveries were on time. There were 35 loaded trucks on the job site at the start of each day. The other obstacle had to do with the timing of the stone delivery. As is often the case, the construction schedule was delayed and delivery was moved back three weeks. However, after one week, the schedule was moved up two weeks and delivery was needed immediately. This happened in July at the busiest season for construction site deliveries. 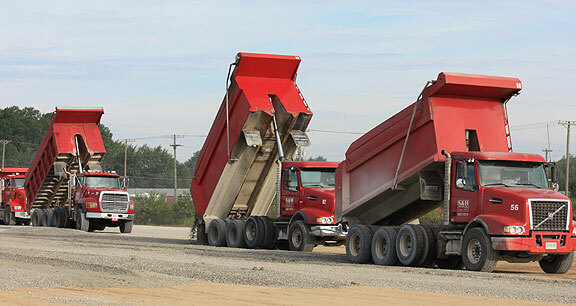 IMI Aggregates division asked a number of independent trucking companies throughout Indiana to send trucks their way during the 3-1/2 day delivery. IMI was able to meet this new deadline because of the relationships it has with trucking vendors. IMI Aggregates was able to meet the demands of this project. When it was complete, over 700 deliveries of stone had been made to the construction site in 3-1/2 days. For more information on IMI Aggregates, click here.